This month certainly went by in a blink of an eye. Blogging takes a back seat during the summer months. So sad, but my little gingers must be the priority during the long days. And long days they have been. The Aeroplane bag is complete! I will do a full blog post with more pictures soon. This bag deserves it's own post for sure, but for now, a sneak peek will have to suffice. I'm all caught up with my Gypsy wife blocks. These blocks make my design wall G-O-R-G-E-O-U-S! I didn't schedule much for June, and I did accomplish everything I set out to finish. Whew, thank goodness! I even bound my sister-in-law's chicken quilt, but I gave it back before taking pictures. You'll have to take my word on that. :) Binding with flannel fabric was no fun, and I will stick with quilting cottons as binding in my own quilts. I was happy to give the chicken quilt back. June ALYoF Post is here. FAL Q2 goal post is here. 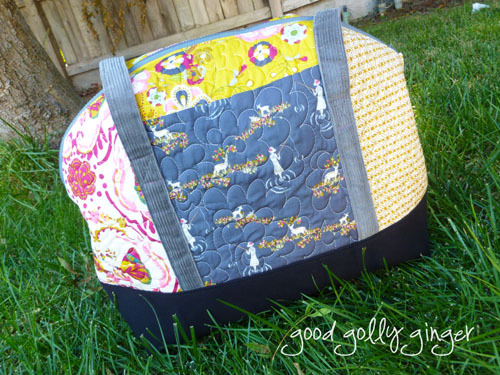 I love the Aeroplane Bag, I made one of those too this quarter! Yay for accomplishing all your goals! I love to use batiks for binding quilts, but they don't always work with a quilt design. I can imagine the flannel was challenging. Loving the colour of those Gypsy wife blocks. 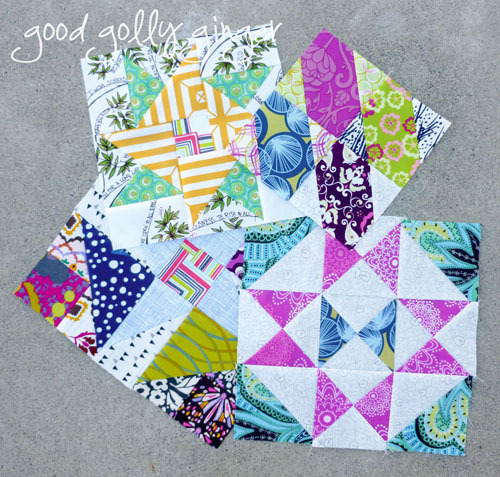 I love the fabrics you've picked for your gypsy wife blocks! I haven't made a bag yet...one is on my "to do someday" list. and a Gypsy Wife! Very cool :) popping in from a fresh sewing day. Happy Canada Day today! Any month I accomplish "everything" I intended is a good month!! I do love the gypsy wife blocks--they're lovely! The Gypsy Wife blocks are great. I love the way that magenta plays with all the other colors!